Aeneas DiCosmo – DE – Oradell (NJ) Bergen Catholic: DiCosmo is a 6’3″, 220 lb. prospect with offers from Clemson, Michigan, Notre Dame, and Stanford, among others. He’s a 3-star, the #41 weakside end, and #558 overall. 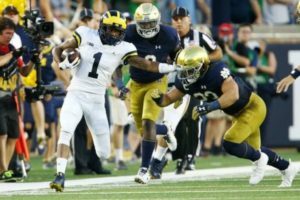 Stanford has 71% of the crystal ball picks, while Michigan has 21%. This is his official visit. 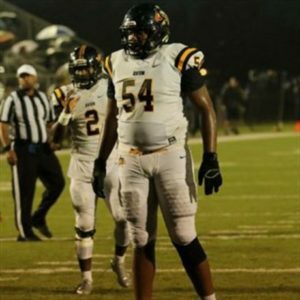 Michael Fletcher – DE – Flint (MI) Carman-Ainsworth: Fletcher is a 6’5″, 240-pounder with offers from Alabama, Michigan, Michigan State, and others. He’s a 3-star, the #25 strongside end, and #394 overall. Right now 88% of the crystal ball picks are for MSU, while Michigan has the other 12%. This is his official visit. He plans to announce his commitment on June 29. UPDATE: Fletcher is no longer visiting. Eric Gray – RB – Memphis (TN) Lausanne: Gray is a 5’10”, 191 lb. prospect with offers from Arkansas, Michigan, Penn State, Stanford, and Tennessee, among others. He’s a 4-star, #3 all-purpose back, and #253 overall. This is his official visit. Zach Harrison – DE – Lewis Center (OH) Olentangy Orange: Harrison is a 6’6″, 240-pounder with offers from everywhere. 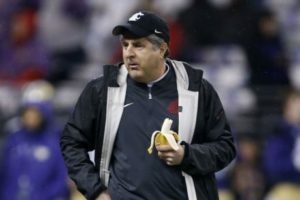 He’s a 5-star, the #3 weakside end, and #4 overall. All fourteen of the crystal ball predictions are for Ohio State, even though some people insist he’s not dead-set on staying in the state. This is his official visit. Chris Hinton – DE – Norcross (GA) Greater Atlanta Christian: Hinton is committed to Michigan (LINK). This is his official visit. Danielson Ike – OT – Kansas City (MO) Rockhurst: Ike is a 6’6″, 300-pounder with offers from Alabama, Michigan, Nebraska, and Oklahoma, among others. He’s a 4-star, the #30 offensive tackle, and #285 overall. Giles Jackson – RB – Oakland (CA) Freedom: Jackson is a 5’8″, 175 lb. prospect with offers from Oregon, Oregon State, and USC, among others. He’s a 247 Sports 3-star, the #7 all-purpose back, and #599 overall. This will be his official visit. Jordan Jakes – WR – Baltimore (MD) St. Frances: Jakes is a 6’4″, 195 lb. 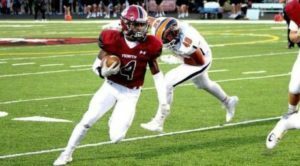 prospect with offers from Georgia Tech, Indiana, and North Carolina, among others. He’s a 3-star, the #116 wide receiver, and #1051 overall. He plays for former Michigan staffer Biff Poggi at St. Frances. 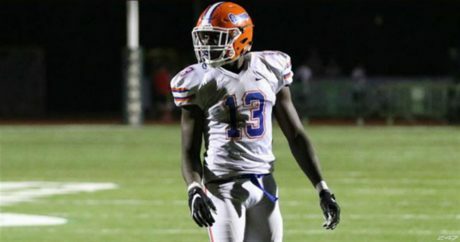 George Johnson III – WR – Stuart (FL) Marin: Johnson is a 5’11”, 180-pounder with offers from Georgia, Georgia Tech, and Michigan, among others. He’s a 247 Sports 3-star, the #91 athlete, and #953 overall. 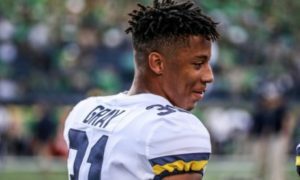 Georgia Tech wants him as an option quarterback, but bigger schools want him as a wideout, including Michigan. 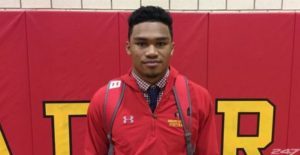 Quinten Johnson – S – Washington (DC) St. John’s: Johnson is a 5’11”, 190 lb. prospect with offers from Alabama, Michigan, and Penn State, among others. He’s a 3-star, the #37 safety, and #472 overall. Steve Wiltfong recently put in a crystal ball pick for Michigan to land his commitment. Trente Jones – OT – Loganville (GA) Grayson: Jones is committed to Michigan (LINK). 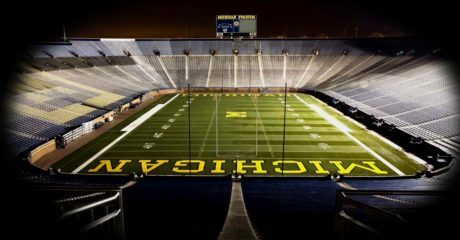 Trevor Keegan – OT – Crystal Lake (MI) South: Keegan is a 6’6″, 310-pounder with offers from Alabama, Clemson, Georgia, Michigan, Ohio State, Penn State, and Wisconsin, among others. He’s a 4-star, the #17 offensive tackle, and #144 overall. 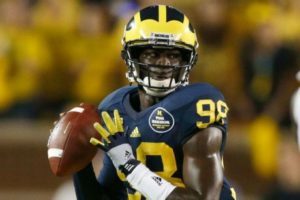 Michigan leads the crystal ball guesses with 56% of the picks. Josiah Miamen – TE – Dunlap (IL) Dunlap: Miamen is a 6’4″, 225 lb. prospect with offers from Illinois, Michigan, Notre Dame, and Penn State, among others. He’s a 3-star, the #64 weakside end, and #910 overall. Michigan is recruiting him as a tight end and has 20% of the crystal ball picks. Tre Mosley – WR – West Bloomfield (MI) West Bloomfield: Mosley is a 6’2″, 180-pounder with offers from Cincinnati, Michigan, Michigan State, and Oregon, among others. He’s a 3-star, the #100 wide receiver, and #819 overall. Right now 100% of the crystal ball picks are in favor of Michigan State. Wandale Robinson – RB – Frankfort (KY) Western Hills: Robinson is a 5’9″, 179 lb. prospect with offers from Alabama, Michigan, and Ohio State, among others. He’s a 3-star, the #5 all-purpose back, and #379 overall. His crystal ball is 43% for Duke, 29% for Kentucky, and 29% for Ohio State. This is his official visit. 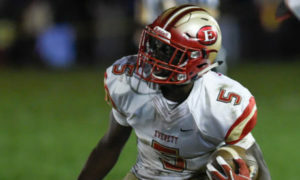 Mike Sainristil – CB – Everett (MA) Everett: Sainristil is currently committed to Virginia Tech. This is his official visit. 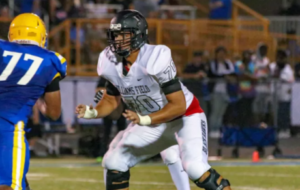 Mazi Smith – DT – Kentwood (MI) East Kentwood: Smith is a 6’3″, 290 lb. 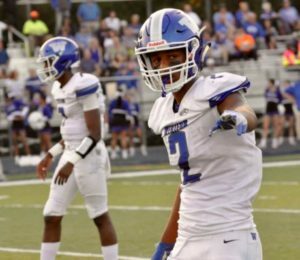 prospect with offers from Alabama, Georgia, Michigan, Ohio State, and Penn State, among others. He’s a 4-star, the #7 defensive tackle, and #124 overall. 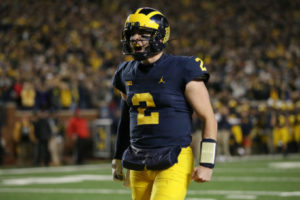 All of his crystal ball picks are for Michigan. Charles Thomas – LB – Bradenton (FL) IMG Academy: Thomas is committed to Michigan (LINK). This is his official visit. D.J. Turner II – CB – Suwanee (GA) North Gwinnett: Turner is a 5’11”, 170 lb. prospect with offers from Alabama, Clemson, Florida, Florida State, Georgia, and Notre Dame, among others. He’s a 3-star, the #41 cornerback, and #442 overall. 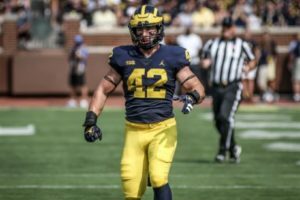 Michigan is the only team with any crystal ball picks, which are up to 13 right now. This is his official visit. 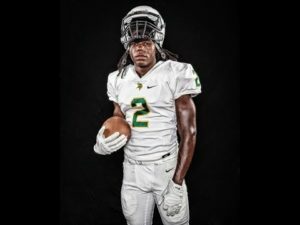 Kyren Williams – RB – St. Louis (MO) St. John Vianney: Williams is a 5’10”, 200-pounder with offers from Michigan, Missouri, and Notre Dame, among others. He’s a 3-star, the #23 running back, and #404 overall. 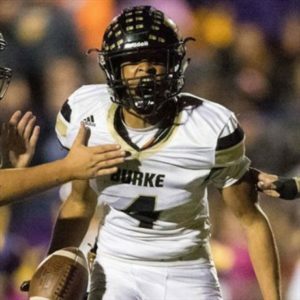 He announced on Monday that he would be making his college choice on Thursday, June 21, and that was right after a visit to Notre Dame. 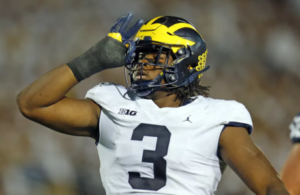 In these cases, that probably means the pick is Notre Dame and he won’t be visiting Michigan after all, but this was supposed to be his official visit to Ann Arbor. Myles Hinton – OT – Norcross (GA) Greater Atlanta Christian: Hinton is a 6’6″, 308-pounder with offers from Alabama, Florida, Georgia, Michigan, Ohio State, and Oklahoma, among others. He’s a 247 Sports 4-star, the #2 offensive tackle, and #10 overall. He’s the younger brother of 2019 Michigan commit Chris Hinton (see above), and a lot of people assume he’ll follow his brother to Michigan. 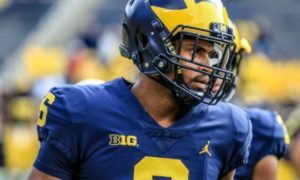 They are both the sons of former Northwestern and NFL offensive tackle Chris Hinton. Makari Paige – S – West Bloomfield (MI) West Bloomfield: Paige is a 6’3″, 182 lb. prospect with offers from Maryland, Michigan, Ohio State, and Penn State, among others. He’s a 247 Sports 4-star, the #8 safety, and #193 overall. He has four crystal ball picks for Michigan, which makes up 100% of the picks so far. Ethan West – LB – Midlothian (VA) Cosby: West is a 6’4″, 220 lb. prospect with offers from Florida, LSU, and North Carolina, among others. He’s a 247 Sports 4-star, the #8 inside linebacker, and #246 overall. Cornell Wheeler – LB – West Bloomfield (MI) West Bloomfield: Wheeler is a 6’1″, 220 lb. prospect with offers from Indiana, Michigan, Minnesota, and Missouri, among others. He’s a 247 Sports 3-star, the #16 inside linebacker, and #413 overall. 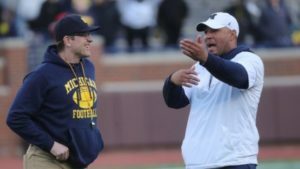 He’s a teammate of Paige (see above), and both of them are coached by former Michigan wide receiver Ronald Bellamy.